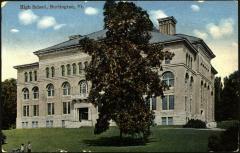 Color postcard of Edmunds High School at 275 Main Street. Captioned "High School, Burlington, Vt." on upper left of image. Postmarked August 3, 1916.